Questions. Questions. Questions. That was how Tom worked--always thinking, always asking questions, until he arrived at a deep understanding or insight that he could use to develop some new invention. As far back as he could remember, Tom had always been asking questions, even as a small boy back in Milan, Ohio. With only three months of formal education, Thomas Edison grew up to be one of the most successful inventors of all time. Applying scientific principles to practical use, he made scores of inventions and held over thirteen hundred patents, from improvements on the telegraph and phonograph to the development of the incandescent lamp and a whole system for distributing electricity. 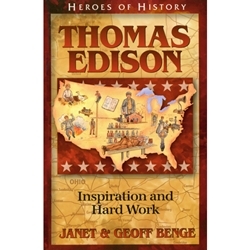 Edison's rise from humble beginnings and his unceasing struggle to overcome obstacles illustrate the spirit of America. His genius and investigative methods shaped the future and continue to influence new generations (1847-1931).